Put on your Sundae’s Best! I’m so happy to have my new fabric line, Madeline, along with its corresponding light shirtings, in the store and available online. We’ve been quilting away and have a few projects to share with you. One of my favorites is Sundae’s Best. 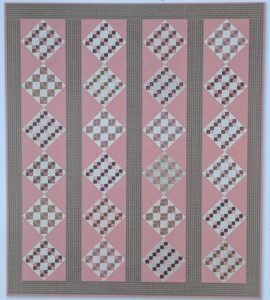 This sweet quilt uses the Madeline line, full of pinks, greens, and browns, along with a very cute brown and pink stripe for the sashing. Finished size on this beauty is 62 1/2″ x 71 1/2″ and the pattern is included.